Fathom Labs | fath-uhm Noun: a unit of length equal to six feet (1.8 meters): used chiefly in nautical measurements. Verb: to penetrate to the truth of; comprehend; understand. fath-uhm Noun: a unit of length equal to six feet (1.8 meters): used chiefly in nautical measurements. Verb: to penetrate to the truth of; comprehend; understand. Despite plans to get out on the lake earlier in the week, today offered the first opportunity to try out the Hydrolab MS5 water quality sonde. With only a short time to be out in the boat, the goal was simply to become familiar with the operation of the sonde by taking a few readings at various depths. Water temperatures at depths from 8 m to the surface ranged between 25C (77F) and 27C (80.6F). As we expected, disolved oxygen levels were inversely proportional to water temperature. 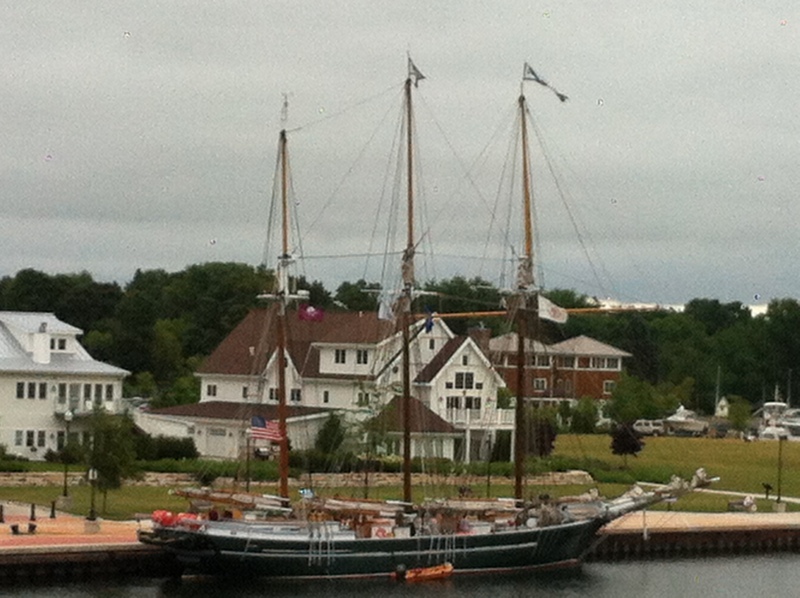 Here is a photo of the S/V Denis Sullivan just before boarding and departing for a two day sailing trip. My wife had planned to sail with me but she did not feel well, so a friend joined me on the trip instead. 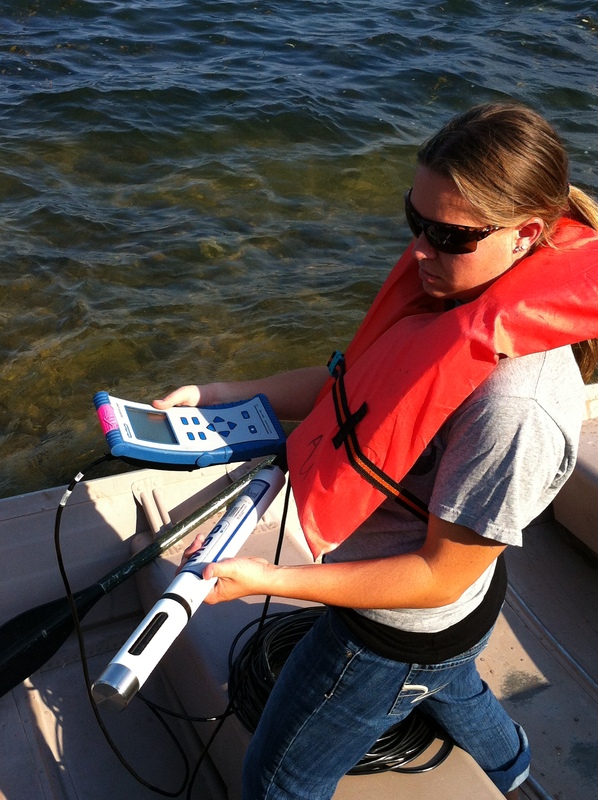 A water quality sonde (probe) allows scientists to gather data in realtime or log it for later analysis. The probe shown below is configured to collect the following data: temperature, pH, disolved oxygen and depth. The handheld terminal displays and logs data gathered by the sensors. 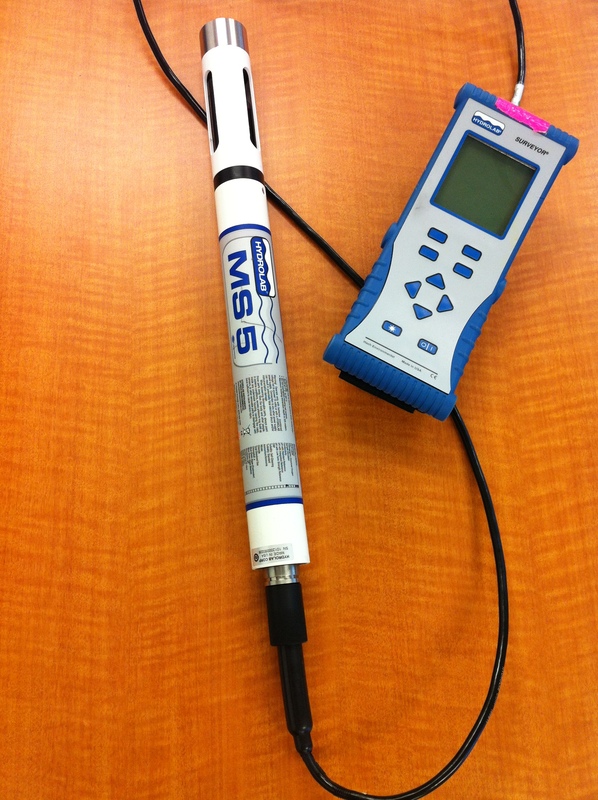 Sondes may be used as portable units in the field or as permanently installed units in settings such as a large aquarium. 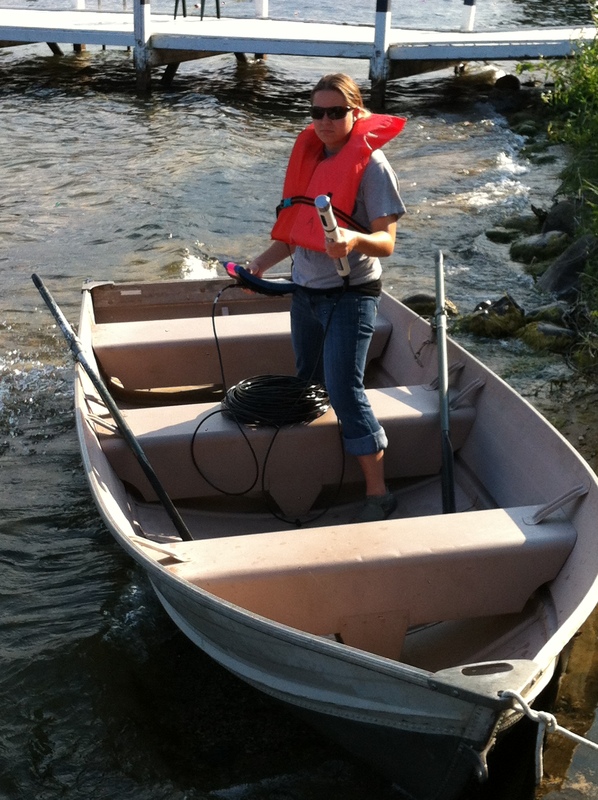 One of my students and I will be taking the sonde out on Geneva Lake (Wisconsin) early next week (weather dependent), so check back for an update on what we learn. 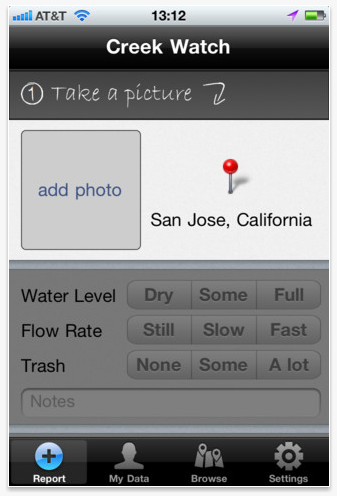 IBM has developed an iPhone app, Creek Watch, that allows users to periodically snap pictures of nearby waterways, record data about water depth and flow, and note any trash that is found at the site. The pictures and data are stored in a database and made available to everyone, especially local water resource managers. 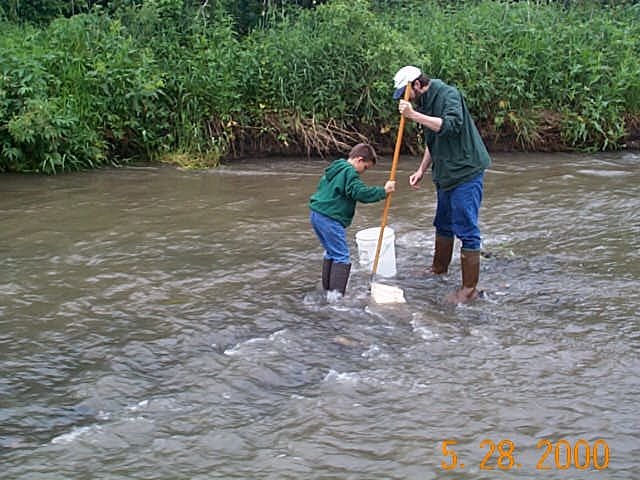 I have participated in RiverWatch which involves measuring stream flow rate, making a map of the riparian zone, and collecting benthic macro invertebrate samples to assess water quality. The data from RiverWatch is more complete than that gathered by Creek Watch, but the collection and analysis process takes a full day and is only done one or two times each year. Although Creek Watch collects less data, it would seem that the simple data collection process might lead to data being collected at more sites and more frequently. It will be interesting to contribute to this project and follow its results. Creek Watch data is available online in tabular and map-based formats here. Update: I tried the Creek Watch app today (July 4, 2012) and found it easy to enter data. At first, I had no luck getting the data to upload to the server. I sent a note to IBM Research and got a response a short while later letting me know that they had found a DNS error, which they corrected. I am really impressed that I received a response in such a short time, especially on a major U.S. holiday. I tried uploading my data again and all worked well. Below is a screenshot from the map view of the data available from the database here. 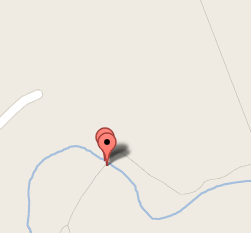 I took pictures looking both directions from the same bridge, hence two pins on the map. I really appreciate that this app does not require setting up an account with a user name and password. Also, the project does not use any gimmicky contests to get people to collect data. Getting data from the database in map or table form is very straightforward. No logging in required, just search and download. Or as close as one can get to doing so in Milwaukee, WI. 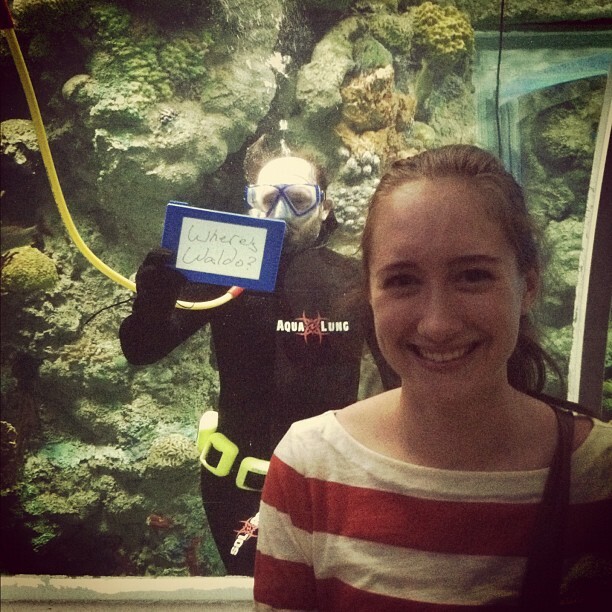 One of my favorite tasks as a volunteer aquarist and diver at the Reiman Aquarium is diving in the Caribbean exhibit. Some of of the work while diving, such as scrubbing algae and fish poop off the coral, is not very glamorous. But it is wonderful practice for doing the task-based type of diving that is done on research dives. I am especially grateful for the privilege of interacting with visitors while diving. It is always fun to see the surprised looks that little kids show as they enter the tunnel and see me in the tank. The pictures here show me getting ready to exit the tank after a dive, and teasing a friend (with her boyfriend’s encouragement) about her wardrobe choice. 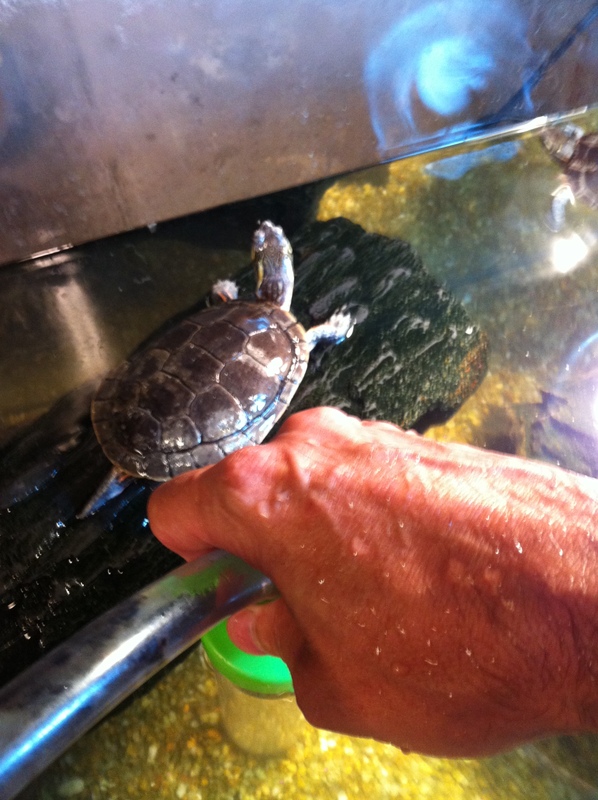 Animal husbandry task: a fancy term for “siphoning turtle poop out of the gravel at the bottom of the tank.” Scientists have a real knack for making the mundane sound special! 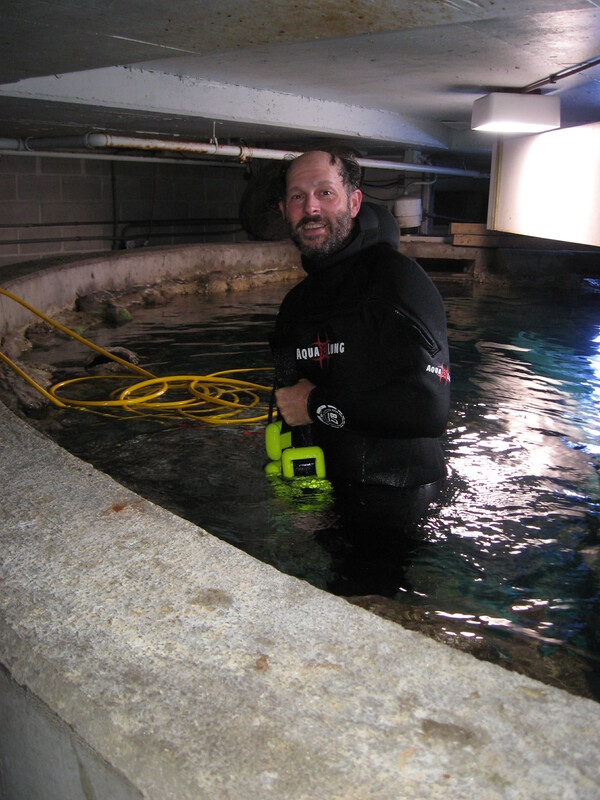 This is just one of the many tasks I do as a volunteer aquarist at the Reiman Aquarium. It is definitely not something that those who are squeamish or faint of heart would enjoy. Yet, I gladly do these types of tasks because they are excellent opportunities to learn. All in the name of science and education. 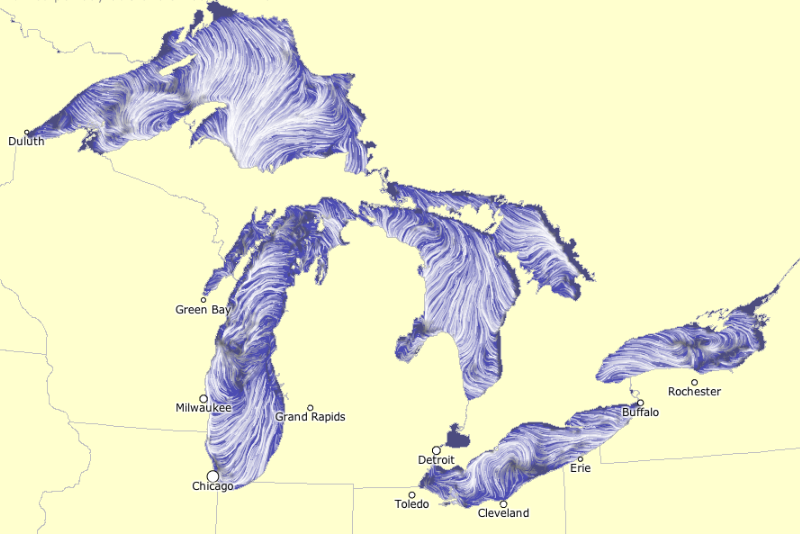 This is a wonderful resource for anyone who uses or studies the Great Lakes. The surface currents map is updated four times each day by NOAA’s Great Lakes Environmental Research Laboratory.